One common mistake we see a lot of new beauty fanatics making is believing the age old wives tail that oils clog your pores. We are here to tell you this is not true! Oils and serums can do wonders for your skin and can actually help cut down natural oil production making your skin have a more even texture. Over the next few weeks, we are going to be sharing a few of our favorite oils that are giving our skin a new lease on youth. For those who might not be in the loop, we love adding an oil or serum to our daily face care regimen for several reasons! A few of the best things about using an oil is that often times they can do a variety of work for your skin. Hydrating and moisturizing your skin while doing deep work on wrinkles and a variety of other skin care needs. 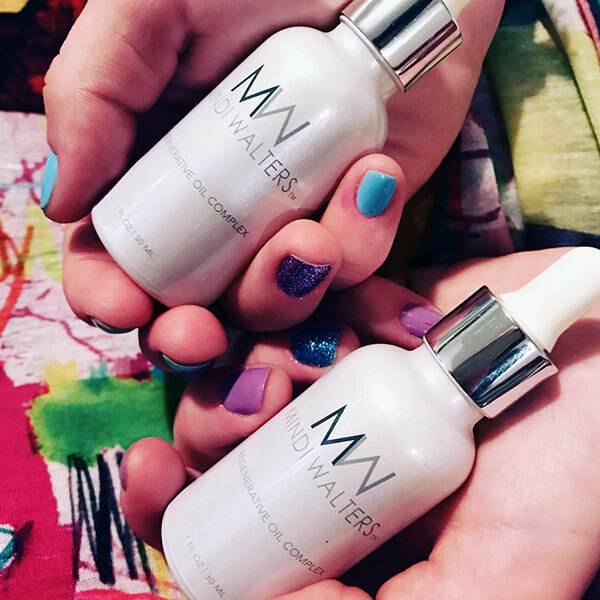 We were excited to get to try a new product released last summer from the impressive Mindi Walters. 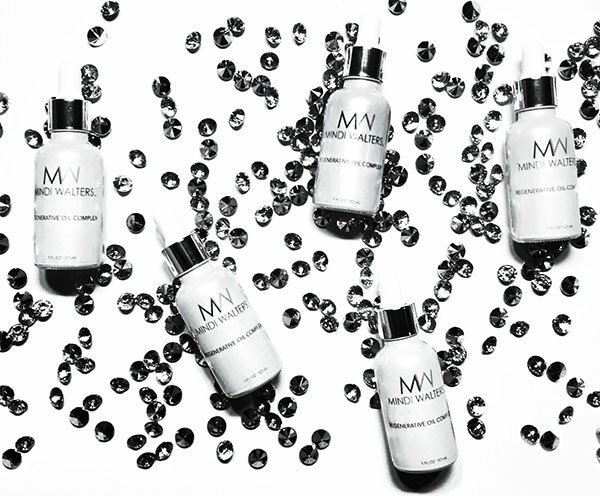 Mindi is known as one of the biggest names in Hollywood as an esthetician to the stars. She travels to clients homes, works on sets and has had her own skin clinic that is frequented by Hollywood’s finest. It is with this experience that Mindi knew she wanted to make a better product for the needs she was seeing daily with her clients. Her co-founder Christopher David is also a skin care expert with years of experience creating products. 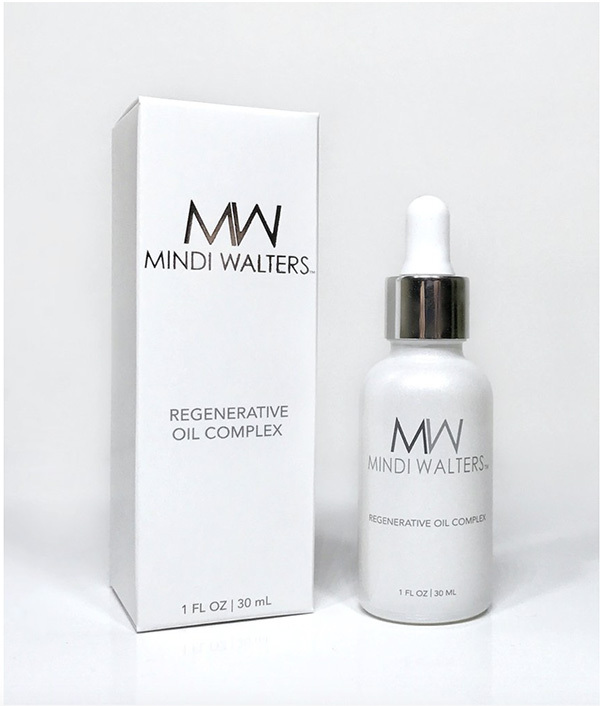 Together they have launched their skincare brand with an amazing Regenerative Oil Complex. The purpose of this complex is adding together the oils Mindi was using on her clients regularly into one super product. This product is intended to be used alone or mixed into your daily moisturizer and is lightweight enough to be added to your morning and evening routine. It has hefty promises of being able to reduce the appearance of sun damage, wrinkles and other signs of aging while increasing collagen production and evening skin tone and texture. 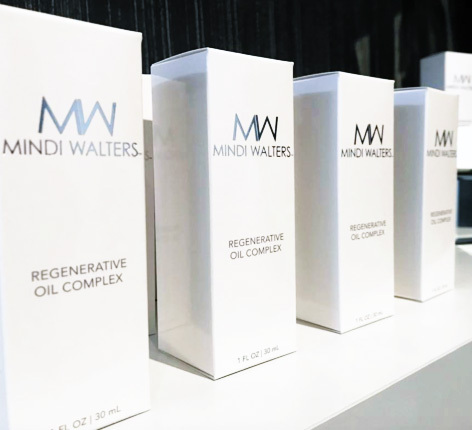 As an added bonus that means a lot to the team at My Top Face, this product is not tested on animals and Mindi Walters Skincare is a member of the Beauty Without Bunnies Program. This means that they do not and never will never test on animals or source ingredients that are tested on animals. MTF Beauty Experts set out to add this oil to our rotation for a full week to see if we could truly see the difference in our complexion. The nine ingredients of this oil are ones we are very familiar with and have loved in the past. Retinol to increase cell turnover and stimulate collagen and elastin production. Rosehip Seed which is high in Vitamin C and Vitamin A, and a master of regenerating tissue, doing wonders on sun damage and wrinkles. Marula Oil which provides your skin with intense hydration and is known for making skin baby soft. Upon first impression the oil doesn’t have a particularly attractive smell, which doesn’t bother us, that just meant fewer additives and probably meant that the formula is more packed with things that actually benefit our complexion, not just fragrance. It is also a bit heavier than we expected for a lightweight oil. We gently pat amount all over our face and neck using two fingers to tap in the oil. After a few minutes, the oil has fully absorbed into our skin and we are ready to put on our makeup. This oil is definitely dense and has a more tactile texture than some other oils we have tried. Our primer goes on more smoothly than it would have without oil and our makeup definitely absorbs less into our face and sits smoothly on top of our skin. During our next use of the oil, we choose to mix it into our favorite moisturizer. For us, this is definitely a better use of this oil as we felt it spread more evenly over our skin and settled in more quickly. At $75 this is a more high-end product so you will be able to get more out of your bottle by adding it into your moisturizer. We continue to use it this way through the rest of our week with it and we are impressed by our end results! MTF Beauty Hack: Try to mix this oil into a lighter weight moisturizer for day. Even the most basic of creams will be great as the Oil Complex can do wonders on its own. You will have an easier time getting the two formulas to mix together if the cream is light! If you are using this product only in the evening we recommend a cream like Jivesse that is a heavy duty cream with light weight! One week later MTF Beauty Experts would definitely say our skin is smoother. But that wasn’t our favorite part of this oil. Believe it or not, we found that the best aspect of this product was that our complexion was far less oily than the beginning of the week. We also felt that there was a more effortless glow about our skin than the beginning of our time with the Regenerative Oil Complex and even started to feel we could go sans most of our face makeup during the day! We did also see some more tightness to face overall which is great. As we have talked about many a times prevention is the best policy so it is never too early to think about tightening up that skin and making sure that youthful glow doesn’t go anywhere too quickly.